Have you heard about the Billionaire Blog Club? Are you looking for an honest Billionaire Blog Club Review? This post will cover what the BBC is all about, and whether it is right for you. What is the Billionaire Blog Club? The Billionaire Blog Club is a course, resource library, and community; for bloggers who want to make money blogging. Paul Scrivens (aka Scrivs) is the creator of the BBC. He is a full-time blogger, who runs numerous successful blogs in several different niches. His goal is to help other bloggers become successful, and make money blogging. A new blogger starting from scratch. A blogger who has launched a blog that is in its early stages. A blogger who is already getting a decent amount of traffic and is ready to grow. How is the Billionaire Blog Club Different? First of all, the Billionaire Blog Club is only open a few times a year. Scrivs does this so that he can manage and interact with new members. He also doesn’t want the community to become overwhelmed with new members. *Special Note – The Billionaire Blog Club is currently open! However, the new and improved BBC is now DTC (Dare to Conquer). The cost is $1,000 for a lifetime membership to both BBC and DTC. I don’t know how long it will be open, so act now if you are interested. For more information see my post on the best blogging courses. The Billionaire Blog Club has an AMAZING community that interacts with each other. They answer questions, share tips and advice, as well as support. Scrivs is even an active member within the community. He often answers questions and offers support. A unique part of the community is the Member Exchange section. Here members can exchange requests to help each other grow their blogs. Requests can include the pinning of pins, or commenting on posts. You can only make a request, after you’ve earned points, by fulfilling other requests. Who is the Billionaire Blog Club For? The Billionaire Blog Club is for the blogger who is serious about growing his/her blog, and wants to make money blogging. This is not a get rich quick course. In fact, no course is. In order be successful, you need to put in the work. The Billionaire Blog Club shows you what you need to do AND how to do it. 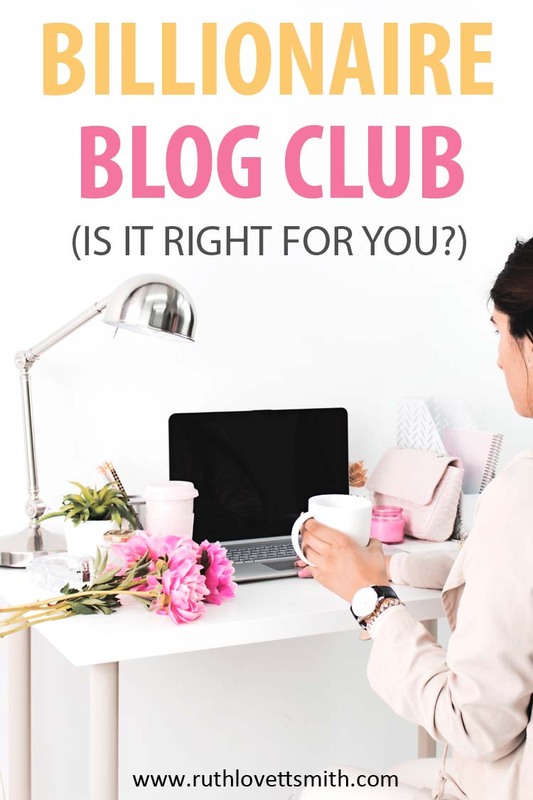 The Billionaire Blog Club is NOT for hobby bloggers, or those who are unwilling to go through the curriculum and do the work. Given the current BBC/DTC price of $1,000, the Billionaire Blog Club is not for you if you are on an extremely tight budget. That being said, I completely believe in investing in you and your business. If you are used to eating out regularly, or get a daily coffee at Starbucks; you are NOT on an extremely tight budget. Give up those items for a short time, and invest in yourself. You will be happy that you did. I will fully admit that this is the first multiple hundred dollar course I have purchased. I am EXTREMELY frugal. However, after purchasing numerous lower priced courses, and reading several BBC reviews, I’ve found that the lower priced courses are often an intro or basic course. The BBC is an all encompassing program. Did I learn anything from the $30 course, the $50 course, etc.? A little bit. Most of which can be found online for free. Have I learned anything from BBC? I am still a new member, going through the numerous resources, and I have already learned a ton. I still have a long way to go, as there is literally that much information. However, I am inspired by the community, current members, and success stories. What I find most intriguing is that Scrivs is humble and honest. He will straight up tell you that this is how he got from A to Z, not that this is the only way to do things. He shows you how to become successful, he doesn’t simply tell you. Why do I think the new BBC/DTC is worth the $1,000 price tag? $1,000 gets you a lifetime membership. The community and member exchange is priceless. The BBC/DTC covers: Blogging, Pinterest, SEO, Affiliate Marketing, Email Marketing, Google Analytics, WordPress, and more. All this, on a course by course basis, would cost so much more. Still Not Sure the BBC/DTC is Right for You? If you are still unsure about the Billionaire Blog Club, try the FREE 12 Day Blogging Bootcamp. This bootcamp is a completely FREE email course that will give you an idea as to whether or not you are ready to start a blog and/or take your blog to that next level. I hope you found this BBC review helpful. Please bookmark this page, as I’ll be updating this review as I continue through the course materials. Remember that membership is open for a limited time. Therefore, if you want to sign up, now is your chance. Click on BBC/DTC for more information, and to join. Nice review here Ruth. Definitely helps to have a blogging course, to get on track. Thanks Ryan! I’m really enjoying the Billionaire Blog Club and am looking forward to all that Dare to Conquer has to offer!